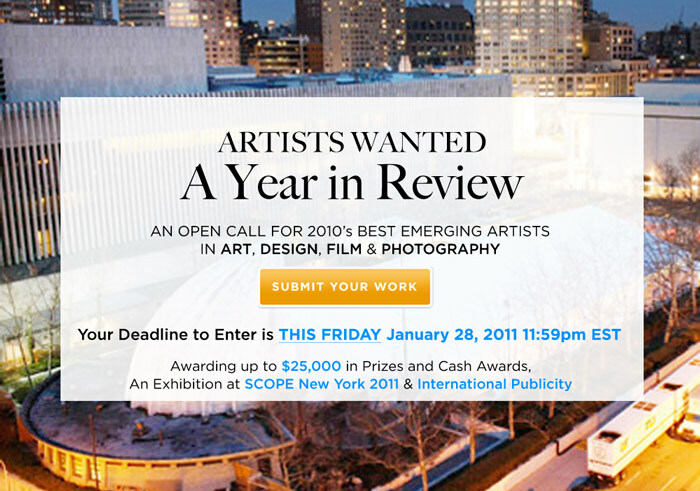 NEW YORK CITY — Only seven days remain to register for Artists Wanted : A Year in Review, an international open call looking for 2010’s best emerging artists in Fine Art, Design & Illustration, Photography, and Motion & Sound to present in a featured exhibition at SCOPE New York during this year’s NYC Armory Week in March. The selected artist(s) will be exhibited in an exclusive feature booth at SCOPE, which is launching their New York edition with a new location. Expanding to a monumental 60,000 sq.ft. hall at 320 West Street, SCOPE New York (March 2-6) will present the selected artist(s), in addition to 45 international exhibitors, incorporating new programs that will host a daily film series and three daily performances. Along with an exclusive feature, the selected Grand Prize artist will receive a $10,000 cash prize, hotel accommodations and airfare to and from New York City, and an international publicity campaign. Moreover, four artists will each receive $1,000 cash and an online feature broadcasted internationally in each of the following categories: Fine Art (Painting, Drawing, Sculpture and Installation), Motion & Sound (Film, Video, Performance and Sound), Design & Illustration, and Photography. One artist who receives the highest number of public votes will receive the $2,000 People’s Choice Award and an online feature. Entries will be reviewed by a talented panel of judges, who are leaders in their fields, dedicated to creative expression and fully supportive in the effort to identify and recognize emerging artistic talent all across the globe.